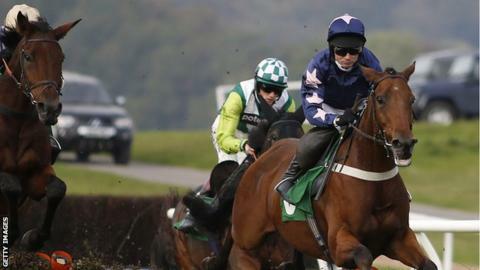 Vale of Glamorgan trainer Evan Williams won three races, including the feature race on both days of the inaugural Chepstow Jumps Festival. The racecourse combined their two October Saturday meetings to create a new bumper weekend of racing with £250,000 of prize money up for grabs. Williams won Saturday's feature race with 40-1 outsider Court Minstrel. He then won Sunday's Grade Two Persian War Novices hurdle with Roadie Joe at 8-1. "It's been an unbelievable weekend," said Williams. "Sometimes the job just goes your way. I've been shouting so much I can hardly talk. It's remarkable." Defying joint-top weight, Court Minstrel, winner of the 2013 Scottish Champion Hurdle, came good under jockey Paul Maloney to take Saturday's £50,000 feature race the Grade 3 totepool Silver Trophy handicap hurdle. Williams added: "It's very difficult to carry a big weight in any handicap so to do it in a race like that is tough. We are over the moon with the win." Williams and Maloney had earlier struck with 14-1 shot Tea In Transvaal, who kept up her 100% since joining the trainer in the summer, making it four wins in a row in the 2m handicap hurdle. Champion trainer, Paul Nicholls was also among the winners, with Adrien Du Pont and It's A Close Call. Of the new fixture format, Nicholls said: "It's a good idea to make it a festival and it's been two days of great racing. "We always aim to have runners here when the ground is decent and it's a good starting point for the rest of the season. "For a lot of horses it's a stepping stone for the future and we hope they are good enough to go on and progress."